Magnets, lightning strikes and even pet hair have led to some of the most challenging and unusual repairs that Ross Hoover has encountered. “With magnet interference or animal hair, there isn’t a part that failed, so you don’t have anything that leads you to the problem,” said Hoover, who is director of service at Summit Truck Group, a dealership based in Lewisville, Texas. Magnetic interference can come from aftermarket components, such as mag­netically mounted side-view cameras or devices drivers attach to the fuel line to try to increase fuel mileage. “A lot of those are being placed close to sensors,” Hoover said. “The sensors are touchy and will randomly throw off codes that will take gobs and gobs of time,” he said, adding that he also has seen situations where a fan clutch has come apart catastrophically. Shedding from drivers’ pets also can create problems. “If a truck is pretty new, you rule out that a filter is plugged up, but when you start to diagnose why a filter isn’t working, you’ll see it is covered in pet hair,” Hoover said. Finding the full progressive damage from a lightning strike is difficult as everything electronic on a Class 8 typically runs through a system called a 5-volt reference. What’s more, all of the different systems on the truck are communicating with each other. Bodkins once saw an issue arise from a sensor in an anti-lock braking system getting bumped during wheel-end work. When fleets encounter challenging repairs, they often turn to dealerships for help. Among some fleets, the need to outsource repairs is increasing as Class 8 trucks become more and more complex. “There is a learning curve, and during that learning curve, we’ll send more to the dealership,” said Dan Carrano, director of fleet maintenance for A. Duie Pyle, a less-than-truckload carrier based in West Chester, Pa. In the past 12 years, the pace of change on new equipment and technology has increased, Carrano said. Automated transmissions, exhaust after­treatment systems and collision mitigation systems have brought new issues. In addition, prior to 2006, the truck had just the engine control module, and the vehicle could produce approximately 300 codes. “Today’s trucks have 11 to 14 different modules, and they can generate thousands of different codes,” Carrano said. A. Duie Pyle ranks No. 79 on the Transport Topics Top 100 list of the largest for-hire carriers in North America. Scott Dixon, operations manager at Four Star Freightliner in Montgomery, Ala., said there is a misconception that the diagnostic code leads technicians directly to the problem. In addition to equipment becoming more sophisticated, comfort features have increased, with drivers and fleets adding satellite televisions, auxiliary power equipment and microwaves. “Every year something new is coming out that is adding a drain or taxing that truck,” said Jim Reed, vice president of truck service marketing at TravelCenters of America. Dixon said in today’s trucks, even mundane tasks, such as changing fuel filters, are getting more complicated. Before buying a new tool, A. Duie Pyle’s Carrano looks at the demand and its cost. If it is something that is needed frequently, the fleet buys it for each of its maintenance facilities. “If it is a tool that isn’t frequently used, we’ll buy two to three and keep them at our parts distribution center so when they need the part, we’ll send the tool,” Carrano said. Summit Truck Group locations share big-ticket, mobile tools that aren’t used daily. These include huck guns that are used to install high-torque fasteners on frame rails as well as counter-bore systems that are used to measure piston cylinder liner protrusion and cut and clean the deck of the cylinder block, Hoover said. Scott Allen, director of fleet assets and maintenance for Lafayette, La.-based Dupré Logistics, said the company transports a mobile alignment machine from location to location. “We might put it in Houston for a couple of months and align a bunch of equipment, then take it to Baton Rouge for a few months,” Allen said, noting this machine can cost $50,000 to $60,000. The company also has a mobile wash system that locations share, he added. Dupré Logistics tries to keep all maintenance in-house, but works with outside providers in areas where it doesn’t have a brick-and-mortar location, and for powertrain repairs — engines, transmissions and rear ends — because the company’s shops don’t have the tooling, time or technicians needed for those, Allen said. Overall, today’s trucks require more sophisticated hardware and software. “It isn’t about turning a screw driver anymore. It is about getting the software and getting into a portal to see how the repair is done,” said Jack ­Poster, vehicle maintenance reporting standards (VMRS) services manager at the Technology & Maintenance Council, part of American Trucking Associations. A. Duie Pyle, which has 18 shops in its network, has one or two laptops at each location. Carrano said all truck makers and component manufacturers, such as Wabco and Bendix, require software for their specific equipment. 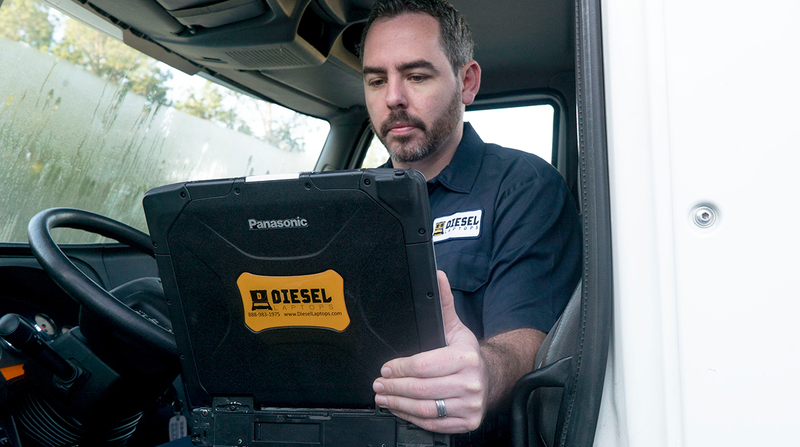 The need for manufacturer-specific technology often means a shop owner who mostly works on Cummins engines but is faced with repairing another brand of equipment would have to buy expensive software for a one-time use or turn the business away, said Tyler Robertson, CEO of Diesel Laptops, a diagnostics software provider. access the machine and help perform the service. The company’s technicians “will perform all the needed work once the kit arrives on-site,” Robertson said. Reed, of TravelCenters of America, said the cost of diagnostic equipment can add up quickly. “You need to make sure you’re buying the right tool and your people are training on it,” he said, adding that without the proper training, even the best tools won’t be used. Kyle Treadway, president of Kenworth Sales Co., a dealership based in West Valley City, Utah, said there has to be critical mass of work to justify the specialized tooling. “If a fleet has a mix of truck makes/models, they are even less likely to invest in tooling and training that is increasingly expensive and specialized,” Treadway said. Dealer technicians must follow tight diagnostic protocols from all component suppliers and OEMs. “Sometimes that means following a late release/update of repair instructions, ordering a specialized part or tool, and/or following step-by-step repair instructions from the OEM/­supplier,” Treadway said. Because technology is changing rapidly, Summit Truck Group has adopted a policy of no printed material. “It just changes too much, and what was the troubleshooting tree today might be different tomorrow,” Hoover said. Fleets and service providers said they have established protocols for technicians to follow if they are stumped. At A. Duie Pyle, technicians can contact the company’s trainer for technical assistance. “He can hop on their laptop and see all of the different readings the laptop is providing and relay what the fleet tech should be looking for,” Carrano said. TA also has a master tech available for technicians to talk to for additional help around the clock, Reed said. At dealerships, technicians can reach out to the OEMs for support. Summit Truck Group also has a ­forum for technicians to share information.